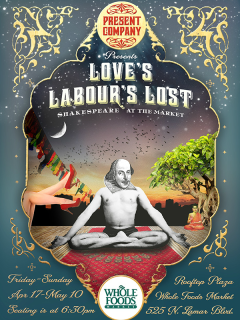 Present Company Theatre and Whole Foods Market are proud to present the second annual Shakespeare at the Market series with a production of Love's Labour's Lost. Guests are encouraged to bring a blanket or short chair and grab picnic goodies from Whole Foods before the show. Admission is free, but a $15-20 donation is suggested.